DENVER –If you fancy an Armstrong Building this summer and are not in the US, you may be disappointed. Although Armstrong Steel's delivery times remain strong (6-8 weeks), demand is higher this year than they predicted for their buildings and will likely continue to exceed their supply over the next several weeks as more consumers scramble to lock in their steel prices before the forecasted 30% increase by years end. They have also taken a large number of Armstrong Building pre-orders for delivery by the end of August. Faced with this surprisingly strong US demand, they have made the difficult decision to postpone international deliveries by two weeks, until the end of May to ensure demands here at home are met first. Armstrong Steel will announce international scheduling in the coming weeks and continue accepting orders from their overseas builders and dealers. Armstrong knows that many international customers waiting to buy an Armstrong Building will be disappointed by this news, but hope they will be pleased to learn the reason – The sheer number of orders placed in the first quarter alone speaks volumes. 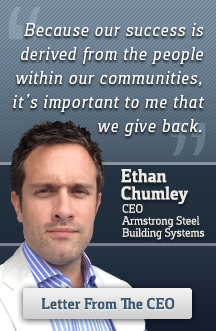 Americans simply won't settle for less than Armstrong Steel quality. Armstrong Steel is a leading supplier of pre-engineered steel buildings and conventional metal buildings for commercial, industrial and religious building projects. They supply a wide range of steel buildings from conventional steel buildings to custom-designed steel frame structures supporting brick, rock, block, stucco and concrete exteriors. Clear span steel buildings are one of the best choices for buildings that need more open space such as riding arenas, agricultural storage buildings, garage buildings, metal church buildings and gymnasiums.